Technics SL-1200G hands-on hands on review | What Hi-Fi? Ever since the return of the Technics brand in 2014, there has been one question on everyone's lips: "Will there be a new Technics turntable?" The recent vinyl revival surely made it inevitable and the good news was confirmed in 2015, when Technics revealed a prototype turntable at the IFA show in Berlin. But that was little more than a shell. Now, at CES in Las Vegas, the wraps are off the finished article. And not only is it a new Technics turntable, it's a new addition to the iconic, arguably unrivalled, SL-1200 series. Introducing, the Technics Grand Classic SL-1200G. A high-end hi-fi turntable aimed at audiophiles that's also every bit the direct drive DJ deck of the SL-1200 and SL-1210 turntables that have gone before it. In fact, Technics has announced two new (but very similar) turntables. First to go on sale this summer will be the SL-1200GAE. It's a 50th anniversary special edition model that will be limited to 1200 turntables, all individually numbered. This will then be followed by the SL-1200G turntable. The limited edition will sport a slightly different finish, a numbered platter, slight tweaks to the feet and a magnesium tonearm (as opposed to aluminium on the standard model). Otherwise, the decks are the same. We're told both models will cost the same, which is around $4000 - more than three times the typical SL-1200 price of previous generations. If you've seen a Technics turntable before, the design will be instantly familiar. The layout of the start/stop button, 33/45rpm selection buttons and target pop-up light are all as before on SL-1200 turntables. The 7in vinyl adaptor is in the top left corner, too. The pitch adjustment and reset button are present and correct in the same spot on the right-hand side. Remove the rubber slipmat and you'll see the three-layered construction of the turntable. There's a gleaming brass-top and heavyweight aluminium platter, under which is the direct-drive motor. Technics says the new turntable has more than twice the inertial mass of the SL-1200Mk5 deck. The deck uses a newly developed "coreless" motor in an effort to remove "cogging", which is sound degradation caused by minute vibrations as the deck rotates, while the twin-rotor construction aims to reduce the bearing load while maintaining high torque. The tonearm uses lightweight magnesium for its damping effect (aluminium in the standard model), while the traditional Technics gimbal suspension construction aims to deliver high sensitivity. The turntable chassis itself is a four-layered design, with a 10mm thick top panel of aluminium added to the aluminium diecast, BMC and rubber layers of previous models. Known for their bullet-proof, super-solid build - which helped establish the deck as the DJ's choice - it looks like the new Technics SL-1200s should do the dynasty proud in this respect. The tentative weight of 18kg (39.7lbs) backs this up. New on this SL-1200G model is a small x2 button above the pitch slider, which will allow you to increase the pitch control to +/-16 (up from +/-8), keeping it in line with more feature-packed DJ decks of the last few years. Also new on this deck will be detachable, gold-plated phono audio cables and ground terminals. Older Technics turntables had hard-wired cabling, which made it tricky to replace them. The SL-1200G won't be supplied with a cartridge as standard, though no doubt your friendly dealer will have plenty they can recommend. 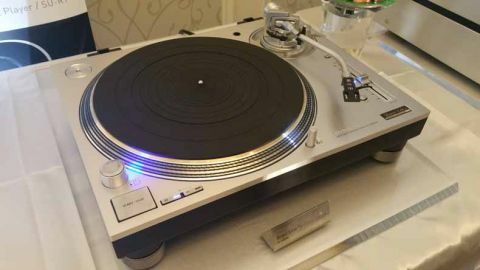 The turntable was playing in Technics' demo room at CES, though the powers that be were adamant that it was a "99%" finished product rather than 100%. Connected to the company's reference series amplifier and speakers there was no denying it sounded like a seriously accurate, clear and detailed presentation. Playing Diana Krall, a classic test record if ever we heard one, voices were natural and there was plenty of space to the recording. Listening to a $10k+ system, you'd naturally expect that, so any real qualitative judegements in isolation at a busy trade show are nigh-on impossible. We resisted the temptation to ask for two decks and a mixer and instead sat back and soaked-up the sound quality while we wondered about that price tag. And arguably it's the hefty price tag and design smarts that have gone into the deck that tell us more about the new SL-1200 at this stage. Technics clearly means business and the company believes it has a worthy successor to such an iconic range of turntables. Mixing it, no pun intended, with turntables at this sort of money mean it needs to sound seriously good, even allowing for the build and DJ features. One thing we know for sure, is there was a huge buzz around the product at CES - and we can't wait to get hold of the finished SL-1200G for a full review.